McGraw-Hill's Food, Nutrition & Wellness teaches students the skills they need to make healthful food choices, prepare nutritious meals, and bring physical activity and wellness practices into their daily lives. 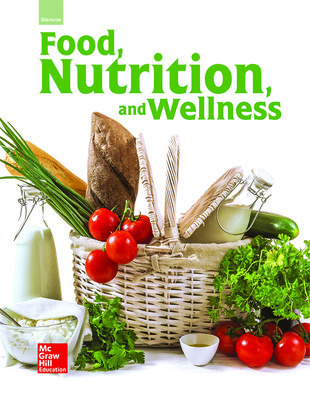 The text focuses on the wellness of mind and body, food and kitchen safety, and the qualities, varieties, and combinations of foods. Interesting features appear throughout the text, including Discover International Foods, Hot Jobs!, Food Prep How To, Math in Action, and Science in Action. Unit projects provide an opportunity for students to apply what they learned to a hands-on activity designed to be academically rigorous and personally relevant and help students build relationships at home, at school, at work, and in the community. Point-of-use academic integration (math, science, and English language arts) help teachers meet Perkins mandates. Includes recipes for both All-American favorites and International dishes. 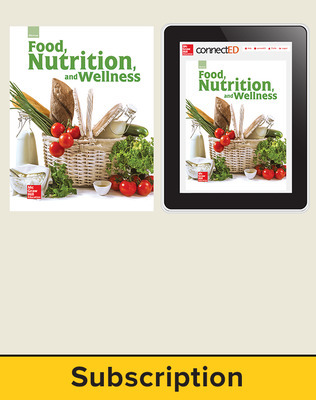 Content updates include new images throughout and changes to MyPlate along with updates to food group names and portion recommendations. 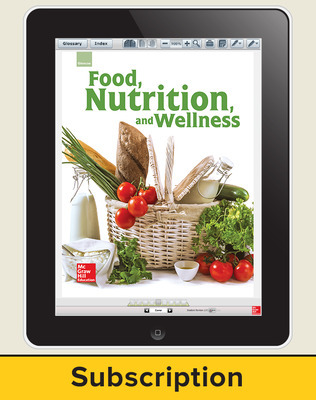 Food, Nutrition, & Wellness © 2016 features online resources on the MHE ConnectED platform empowering teachers to easily teach, manage classroom assignments, and engage students. Teachers can access the student eBook, digital resources, assessment and planning tools in one convenient location. Print teacher editions are available print-on-demand on Create™.